This past Christmas season, Thomas was one of the Redondo Beach (California) Corps’ best bellringers. Cadet Denise Litreal, stationed at the corps during kettle season with her husband, Mark, said Thomas would take three buses every day to reach the corps, arriving early so the Litreals could take him to his kettle stand at the local Ralph’s grocery store. “I want you to know how much my having this job has helped my family,” Thomas told the Litreals during the last week of kettle season. It had been a tough year for Thomas, who currently lives in an extended stay hotel in Los Angeles with his three younger siblings, after his family experienced homelessness when their parent became ill and they had to leave their apartment. “They’ve been trying to recover from these hard times since,” Litreal said. 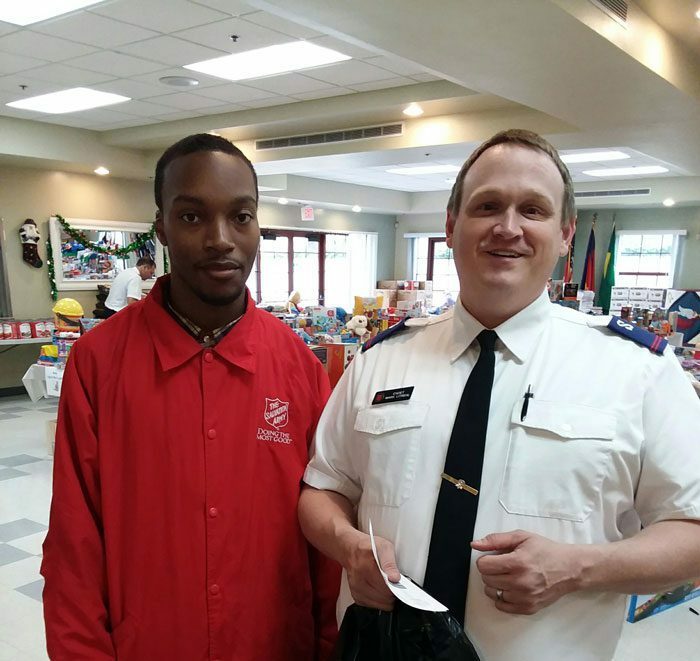 Thomas and Cadet Mark Litreal at the Redondo Beach Corps’ Toy-N-Joy distribution. Thomas got to “shop” for his siblings at the corps’ Toy-N-Joy distribution, providing them with a Christmas they otherwise would not have had. As a young man with special needs, Thomas isn’t able to work at most jobs.